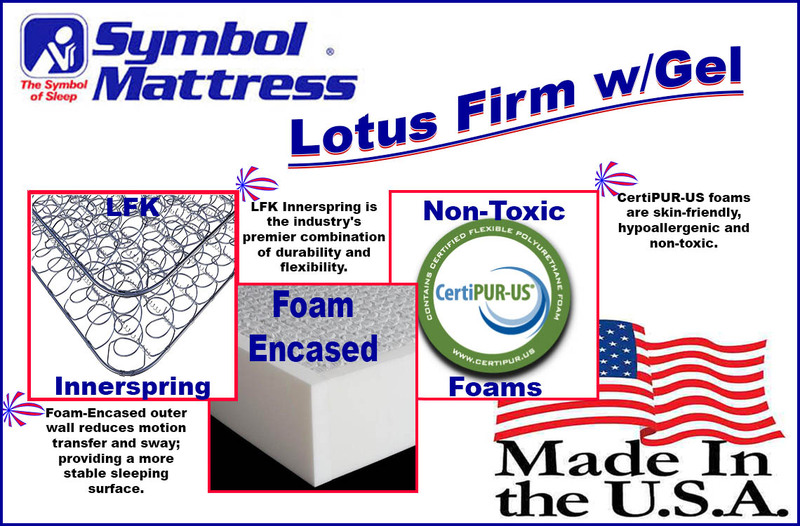 The "Lotus Firm w/Gel" is great value that's offered from the Symbol Mattress "Comfortec" line. It contains an LFK Offset Innerspring Coil Unit and foam encased edges. It's 11.5" thick, contains more than 3" of high-quality (American Made) foam atop its coil unit and an insulator pad - to separate the two main components. This mattress can be ordered in both standard sizes and custom (odd) sizes. Its a great combination of firm support and contouring comfort. Its gel lumbar pad gives just a bit more of support in the mattress's most important area. This is the single-sided version but this mattress is available in a double-sided variation. A great value - with the Queen size coming in under $500 - the Lotus Firm is a dependable, comfortable, long-lasting mattress. This is one of our most recommended firm models for those shopping in the middle price range. The "luxury firm" distinction usually falls on firm-feel mattresses that are built with individually-wrapped pocket coil springs. That being said, I'd consider an LFK coil to provide the same luxuriously firm feel but with a bit more durability. That's what makes the "Comfortec Lotus Firm w/Gel" such a great value in the mattress marketplace. This coil unit is made to contour to the body with its offset design but to also provide a considerably high amount of strength. A gel lumbar isn't noticeable at first glance but, over time, is going to offer a bit more support in the middle-third of your bed, and your body. Dense foam encasement keeps the bed steady and cuts down on motion transfer. An insulator pad keeps foam from dipping into the springs, over time. This is a high-quality (but cheaply priced) luxury firm mattress. The manufacturer is an American company, and Symbol makes its own foam. There are a lot of great factors about this mattress and if a firmer feel is what you're looking for, I'd recommend this as an option. 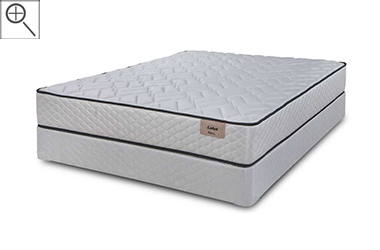 If you're looking for something that is as firm as can be, I'd recommend taking a look at the Corvina Extra Firm Double Sided Mattress. This mattress will have the same high-quality coil unit but nearly zero give in its foam layers.